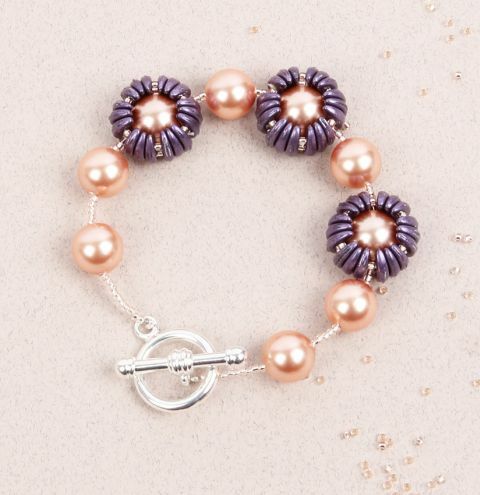 Learn how to make a pretty bracelet for Spring with crescent beads and Swarovski pearls. 1. Beaded Bead: On 1yd of thread, add three CMC (CzechMate Crescent Bead), and one S15 (Size 15 seed bead). Repeat five more times, making sure that each CMC added is oriented in the same direction. Form a ring and tie a square knot against the tail. Pass through all beads again, pulling snug as you go. After passing through three CMC, jump to the second hole of CMC. Pass through the open holes of the next two CMC. 2. Add S15, then pass through the open holes of the next three CMCs. Repeat five more times. Drop one RB (Round Pearl Bead) inside the ring of CMC. Pass through all beads in this step again, pulling snug as you go. The RB should be able to rotate freely within the ring. Knot and tie off. 3. Repeat Steps 1–2 to make a total of 3 beaded beads. 4. Stringing: a) On 1ft of wire, add a crimp bead and one half the clasp. Pass back through the crimp bead, and leave 2 inch tail. Crimp the bead. b) Add ten S15, making sure they thread over the 2 inch tail thread exiting the crimp bead. the hole in the pearl. d) Add 5 x S15, 1 x RB, 5 x S15, 1 x beaded bead and repeat the pattern to mirror the completed side of the bracelet or following the image. 5. Finish your design by repeating the process of adding the other half of the clasp - add a crimp bead and the other half the clasp. Pass back through the crimp bead, and pass the thread back into the beads. Continue through the beads and exit before your second pearl. Pull this thread tightly to close any loop of thread near the clasp and squash the crimp bead to secure in place. Trim off the excess thread.